All the daily Formula One news you need. A wet start to the Belgian Grand Prix was expected, many fans throughout the world wanted one but it didn’t arrive at the start. The five red lights went out and pole sitter Lewis Hamilton got a clean start and maintained the lead heading into Turn 1 but Sebastian Vettel snatched the lead from Hamilton on the Kemmel straight. Biggest gainers were Jenson Button and Nico Rosberg. Paul Di Resta lost two places at the start. At the end of lap two Vettel was 2.8s ahead of Lewis Hamilton. Felipe Massa had a KERS failure on lap four. Fernando Alonso using DRS went passed Jenson Button fir fourth position and within the next few laps Nico Rosberg for third place. Kimi Raikkonen having break duct issues on lap nine still continued to push and continued passing few cars. Felipe Massa and Nico Hulkenberg were the first ones to pit on lap ten. On lap eleven Paul Di Resta pitted and Charles Pic was forced into retirement due to technical issues. On lap thirteen Nico Rosberg pitted. After Lewis Hamilton’s pit stop he spent most of the time behind Romain Grosjean and the former passed him on lap fourteen. Lewis Hamilton was under immense pressure from Fernando Alonso behind and was overtaken on lap fifteen. Sebastian Vettel pitted on lap fourteen and took the lead from Jenson Button on lap sixteen. Mark Webber was the only driver among the front-runners to go onto the hard tyres during his first pit stop. Jenson Button pitted on lap eighteen for hard tyres, his teammate pitted after two laps. Romain Grosjean on a set of medium tyres went on till lap twenty-three, he was clearly on a one pit stop strategy. On lap twenty-four Sebastian Vettel was leading the race from Fernando Alonso by 8.8 seconds and 13 seconds from Lewis Hamilton. On lap twenty-six Kimi Raikkonen ended his consecutive 27 races points finishing record. Lewis Hamilton, Felipe Massa pitted on lap twenty-six. On lap twenty-eight Paul Di Resta had a collision with Pastor Maldonado taking the former out of the race and the latter was handed a STOP/GO Penalty. Mark Webber pitted on lap thirty for medium tyres and his teammate on lap thirty-one for hard tyres and his final pit stop of the race and was still in the race lead. 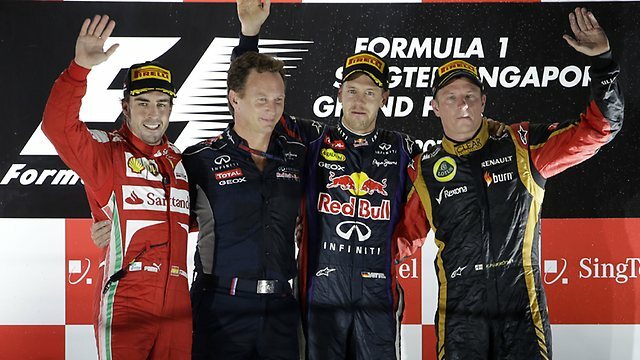 Nico Rosberg, Mark Webber were in fight for third place. With ten laps to go it looked that Sebastian Vettel was untouchable. Jenson Button pitted on lap thirty-five for fighting for the final podium spot but the strategy McLaren opted didn’t pay off. The final six laps were easy for Sebastian Vettel and cruised to the chequered flag with a great performance from Fernando Alonso coming home in second who started from eighth and the pole sitter came home in third while his team-mate came home in fourth, Mark Webber in fifth, Jenson Button in sixth, Felipe Massa in seventh, Romain Grosjean in eighth, Adrian Sutil in ninth and Daniel Ricciardo in tenth. The Drivers Championship and Constructors Championship as it stands after Round 11:started from eight and pole sitter came home in third place, his teammate Nico Rosberg came home in fourth with Webber coming home in fifth, Button in sixth, Massa in seventh, Grosjean in eight, Sutil in ninth and Ricciardo the final point scoring driver. Notes: Sebastian Vettel leads the championship by 46 points from Fernando Alonso. Jenson Button’s fifth place finish helps Mclaren move ahead of Force India in the constructors championship by four points. Lotus drop to fourth in the constructors standings. Today was announced that F1 will comeback to the Red Bull Ring (A1 Ring back then) at the 6th of July 2014. But the agency of Spielberg (there were the Red Bull Ring is located on) have to give the official okay. The Austrian GP should have already comeback this year, but Ecclestone disagreed. Ecclestone disagreed because the Red Bull Ring wouldn’t have enough Hotel rooms. But now he agreed with Dr. Helmut Marko and Dietrich Mateschitz who are behind this ”Austrian GP comeback”. F1 was driving the current layout from 1997-2003, called A1-Ring, but they also drove the old layout, called Österreichring from 1970-1987. But it’s still uncertain who will pay the Grand Prix tax, which are Millions of euros. But finally a classy track comes new to the F1 calender, but also with the new New Jersey GP starting next year, it would be hard for the teams to race 22 GP’s in a year. Yesterday Codemasters announced F1 2013. They uploaded three trailers at their official Youtube channel and showed two hotlaps, the Lotus E20 at the Nürburgring and the Mclaren MP4-28 at Silverstone. But the third trailer was the most interesting one, the classics trailer. They announced that they will bring overall 4 classic tracks (Estoril, Jerez, Imola and Brands Hatch) and 10 historic cars, 5 cars each for the 80’s and the 90’s including 17 driver legends with commentary from commentator legend Murray Walker (!). The 80’s cars and tracks will be in the stantard edition, but when you also want to play the 90’s cars and tracks, you will have to buy the classic edition. Codemasters didn’t mentioned if the boxed version of the classic edition will be only for pre order and then later available as DLC, as it was in GRID 2 were you could choose between one free DLC car pack for the pre ordered version of the game. The classic edition can be not bought in the boxed version, when you buy F1 2013 on PC/Steam. You will have to download it as additional content to the stantard F1 2013. The classic cars are also playable in online and local multiplayer. You will also have the chance to play the historic cars on the new tracks and the 2013 cars on the classic tracks. Codemasters said that the historic cars are going to be much harder to drive than the current ones. The physics of the 2013 cars and the A.I. have been improved. The Williams-Renault FW148 from the F1 1992 season, driven by Nigel Mansell and Ricardo Patrese. People that were able to play the Preview version of F1 2013 at Press day said that the handling system is similar to the 2011 version. Codemasters didn’t said anything about the penalty system, what was the most discussed point at F1 2012. Honestly, i’m not that excited, I want to see more info about the game, especially the penalty sytem, menu system etc. So I won’t pre order it for now, too risky. The game will come out for Xbox 360, PS3 and PC, F1 2013 won’t come for the next-gen consoles (Xbox One, PS4) and the realese date will most likely come at the end of September.